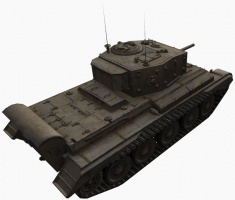 The Cromwell, or "Crommie", is a generally well-liked medium tank with impressive maneuverability that no other tier 6 medium tank can offer, but at the cost of rather weak armor. Its Vickers HV gun is comparable to the German 75mm L/70, making it suited for high speed flanking maneuvers and also long and medium range fire support. Beware the unusually poor dispersion values, try to get in close for flanking. Its impressive power to weight ratio and maneuverability can allow it to actively scout as well as zig-zagging to easily avoid enemy fire, though the radio leaves something to be desired. 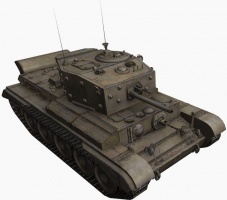 The Cromwell combines great speed, acceleration and maneuverability with a reasonably powerful and fast firing gun. It's one of the best flankers, but keep in mind that your speed is your only real defense. Its armor is neither thick nor sloped and it is vulnerable to most enemy fire. In contrast to the other tier 6 mediums, it gains only little advantages from hull down situations, since its turret is neither well rounded like the T-34-85's, nor features a thick gun mantlet like many German or American tier 6 medium tanks. The rather decent 8 degrees of gun depression give it more flexibility around hilly terrain, however. Due to its great mobility, this tank should be played as a flanker while it can also function as a quite good scout. Optionally, its powerful gun also allows a less aggressive, more supportive play style. Note that the Cromwell has nearly no depression when looking back, so be careful with breakthroughs on hills and that the shell travel speed is a bit slow. 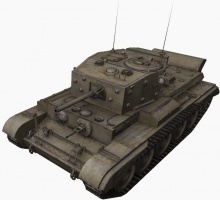 From its predecessor, the Crusader, the Cromwell receives the 6 pdr Gun Mk. V (L/50) (low damage but usable penetration) and WS No. 19 Mk. III. Both should be installed immediately. Speed is important in this tank. That's a good reason to research the Rolls-Royce Meteor engine. This will enhance your acceleration a lot and will help you to survive. Then research the turret and upgraded guns (the earlier 6-Pounder Mk. V gun may be preferable to the 75mm gun Mk. V as you get the XP for the top gun due to the penetration). After that, you can pick up the 3.7-inch Howitzer if you wish. Cruiser Mk VIII known as the Cromwell (A27M) tank, and the related Centaur (A27L) tank, were one of the most successful series of cruiser tanks fielded by Britain in the Second World War. 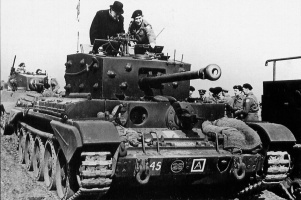 The Cromwell tank, named after the English Civil War leader Oliver Cromwell, was the first tank in the British arsenal to combine a dual-purpose gun, high speed from the powerful and reliable Meteor engine, and reasonable armour, all in one balanced package. Its design formed the basis of the Comet tank. 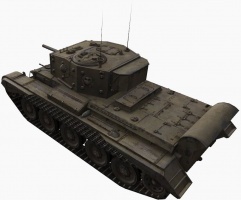 The Cromwell and Centaur differed in the engine used. 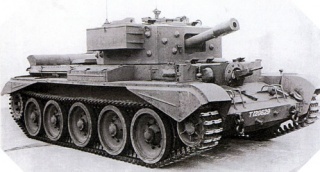 While the Centaur had the Liberty engine of the predecessor cruiser tank, the Crusader, the Cromwell had the significantly more powerful Meteor. 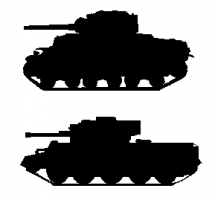 Aside from the engine and associated transmission differences, the two tanks were effectively the same and many Centaurs built were given the Meteor to make them Cromwells. 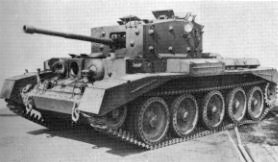 The Cromwell and the related Centaur were the product of further development of British cruiser tanks, and they were designed as the replacement for the Crusader tank, which although not yet in service would become obsolete in time. 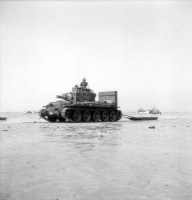 In late 1940, the General Staff set out the specifications for the new tank, and designs were submitted in early 1941. The tank would be fitted with the QF 6 pounder gun with the expectation that it would enter service in 1942. Due to the typical rushed production and lack of components, the A24 Cavalier, then known as "Cromwell I", built by Nuffield had far too many problems to see active combat service. One of the key problems was that its Nuffield-built Liberty engine was simply not up to the task. It had been ordered as it was based on tried equipment and therefore should have entered service with minimal delay. Leyland and Birmingham Railway Carriage & Wagon had been involved in the development and had offered similar designs to Nuffield. A second specification for a better tank was the General Staff A27. The tank would be fitted with the QF 6 pounder gun with the expectation that it would enter service in 1942. Once it became clear there would be delays, a programme was set in place to fit the 6 pounder to the Crusader to get some 6 pounder tanks in service.At the same time, a new engine was designed to be a tank powerplant. The Meteor engine was based on the powerful Rolls-Royce Merlin engine used in aircraft such as the Spitfire. Rolls-Royce, Leyland and BRC&W produced a prototype by January 1942 based on the Crusader but using the Meteor. With nearly 600 hp (450 kW) it proved to be exceptionally mobile when trialled. Leyland were lined up to produce the Meteor but withdrew in mid-1941 as they had doubts about being able to provide sufficient cooling. Rolls-Royce, the makers of the Merlin, were already fully committed to manufacturing the Merlin and could not spare the facilities for the Meteor, and so manufacture was passed to the Rover Car Company. 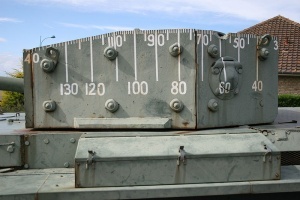 The General staff issued new specifications to cover the tanks. The BRC&W design using the Meteor was A27M (or "Cromwell III") and Leyland's version of it to take the Liberty was A27L ("Cromwell II"). Nuffields A24 with the Liberty was the Cromwell II. The naming was reworked in November 1942 with the A27L as Centaur, A27M as Cromwell and A24 as Cavalier. Production began in November 1942. It would take considerable time for Rover to make ready production lines for the Meteor, and it was not until a few months later, in January 1943, that sufficient Meteor engines were available and the A27M Cromwell began production. The Centaur production design allowed for the later conversion to the Meteor engine and many Centaurs would be converted to Cromwells before use. The frame was of rivetted construction though welding was used later. The armour plate was then bolted to the frame; large bosses on the outside of the plate were used on the turret. Several British firms besides Leyland contributed to production of the Cromwell and Centaur including LMS Railway, Morris Motors, Metro-Cammell, Birmingham Railway Carriage and Wagon Company and English Electric. 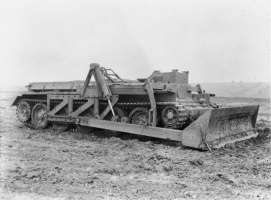 Some variants were produced with 14-inch-wide (360 mm) tracks, later 15.5-inch tracks were used. The suspension was of the Christie type with long helical springs (in tension) angled back to keep the hull sides low. Of the five roadwheels each side, four had shock absorbers. The tracks were driven by sprocketed wheels at the rear and tension adjusted at the front idler; this being standard British practice. The side of the hull was made up of two spaced plates, the suspension units between them, and the outer plate having cutouts for the movement of the roadwheel axles. The gearbox had five forward and one reverse gears. The first gear was for "confined spaces, on steep inclines or sharp turns". The Meteor engine delivered 540 hp at 2,250 rpm. This was the maximum rpm which was limited by governors built into the magnetos. Fuel consumption on "pool" petrol (67octane) was between 0.5 and 1.5 miles per gallon depending on terrain. The driver was sat on the right in the front of the hull, separated from the hull gunner by a bulkhead. The driver had two periscopes and a visor in the hull front. The visor could be opened fully or a small "gate" in it opened; in the latter case a thick glass block protected the driver. A bulkhead with access holes separated the driver and hull gunner from the fighting compartment. A further bulkhead separated the fighting compartment from the engine and transmission bay. The engine compartment drew cooling air in through the top of each side and the roof and exhausted it to the rear. To allow fording through up to 4 ft (1.2 m) deep water a flap could be moved over to cover the lowermost air outlet. Air for the engine could be drawn from the fighting compartment or the exterior; it was then passed through oil bath cleaners. The Cromwell still had revisions to make before service, most notably changing from the QF 6-pounder (57 mm) to the ROQF 75 mm gun, which was an adaptation of the 6 pounder design to fire the ammunition of the US M3 75 mm gun, which gave it a better HE round to use in infantry support. 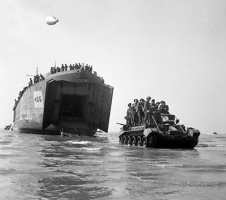 This meant the 75 would use the same mounting as the 6 pounder however it was not until June 1944 that Cromwell first saw action during Operation Overlord, the Allied invasion of Normandy. It had a mixed reception by crews. It was faster and had a lower profile than the Sherman tank and thicker frontal armour; 3 in (76 mm) versus the 2 in (51 mm) of the Sherman. On later Cromwells this was increased incrementally, first to 31/4 in (83 mm), then finally to 4 in (100 mm). The 75 mm gun, though able to fire a useful HE shell, was not as effective against armour as the 6 pdr or the Ordnance QF 17 pounder gun though it was more powerful than the original 75 mm gun mounted on the Sherman. A derivative of Cromwell was begun to take the 17 pounder, this fell behind and in practice the majority of the 17 pounder gun armed tanks to see service in the war were Firefly variant of the Sherman. There was a 7.92 mm Besa machine gun mounted coaxially to the main armament operated by the gunner. A second was "gimbal" mounted in the front of the hull. The mounting gave 45 degress of coverage to the front (it had 25 degrees of vertical movement as well) and sighting was by a No. 35 telescope which was connected through a linkage to the mounting. In the top of the turret was mounted a 2 inch "bombthrower" angled to fire forward. Thirty smoke grenades were carried for it. 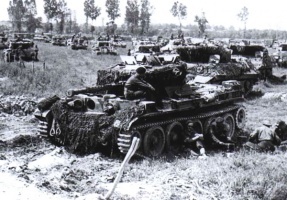 Total A27 production consisted of 4,016 tanks; 950 of which were Centaurs and 3,066 Cromwells. In addition, 375 Centaur hulls were built to be fitted with an anti-aircraft gun turret; only 95 of these were completed. The Cromwell was the fastest British tank to serve in the Second World War, with a top (ungoverned) speed of 40 mph (64 km/h). However this speed proved too much for even the Christie suspension and the engine was governed to give a top speed of 32 mph (51 km/h), which was still fast for its time. Thanks to its Christie parentage the Cromwell was very agile on the battlefield. The dual purpose 75 mm main gun fired the same ammunition as the US 75 mm gun and therefore it had around the same HE and armour-piercing capabilities as the 75 mm equipped Sherman tank. 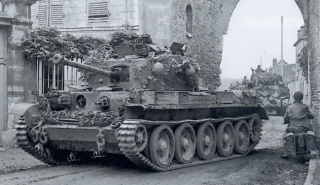 The armour on the Cromwell ranged from 8 mm up to 76 mm thick overall. 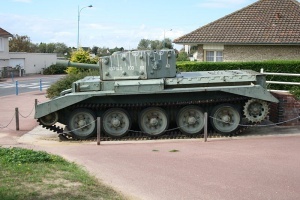 However, on all-welded vehicles built by BRCW Co. Ltd, the weight saved by the welding allowed for the fitting of appliqué armour plates on the nose, vertical drivers' plate and turret front, increasing the maximum thickness to 102 mm. 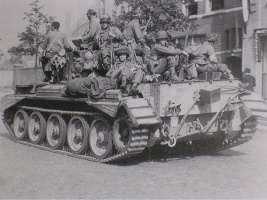 In period photos, these vehicles are identified by their War Department numbers carrying the suffix W, i.e. T121710W. This armour compared well with that of the Sherman although the Cromwell did not share the Sherman’s sloped glacis plate. The Cromwell crews in North-West Europe succeeded in outflanking the heavier and more sluggish German tanks with superior speed, manoeuvrability and reliability. However, the Cromwell was still not a match for the best German armour and British tank design would go through another stage, the interim Comet tank, before going ahead in the tank development race with the Centurion tank. The Centaur was chiefly used for training; only those in specialist roles saw action. The Close Support version of the Centaur with a 95 mm howitzer replacing the 75mm saw service in small numbers as part of the Royal Marine Armoured Support Group on D-Day, and a number were used as the basis for combat engineering vehicles such as an armoured bulldozer. The Sherman remained the most common tank in British and Commonwealth armoured units. 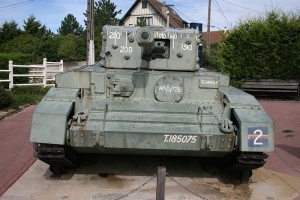 Cromwells were used to fully equip only one division, the 7th Armoured Division. The Cromwell was also used as the main tank in the armoured reconnaissance regiments of British armoured divisions (Guards Armoured Division and 11th Armoured Division) in North West Europe, because of its great speed and relatively low profile. 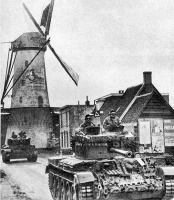 The Cromwell in turn was succeeded by small numbers of the Comet tank. The Comet was similar to the Cromwell, and shared some components, but had a superior gun in the 77 mm gun (a version of the 17 pounder). In general the Cromwell was found to be very reliable with remarkable speed and manoeuvrability though it required more maintenance than the Sherman. The Cromwell was given a modification to the exhaust to direct the fumes so that they were not drawn into the fighting compartment - a problem found when tanks were drawn up together preparing for the advance. 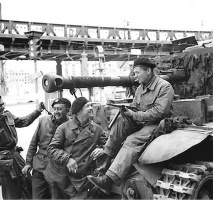 In northern Europe, the Cromwell was used by Allied units of the 1st Polish Armoured Division (10th Mounted Rifle Regiment) and 1st Czechoslovak Independent Armoured Brigade. 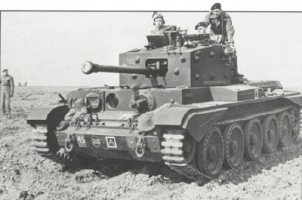 After the war, the Cromwell remained in British service. It saw service in the Korean War with 7 RTR and the 8th King's Royal Irish Hussars. 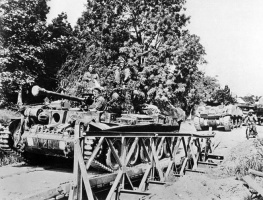 The Cromwell/Centaur had the distinction of being the first tank to go into service with the Greek Army during the reformation following the Second World War. 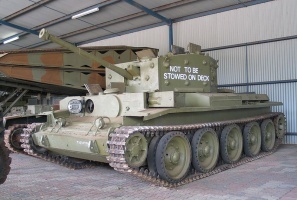 Fifty-two Centaur I tanks were donated early in 1946, during the opening stages of the Greek Civil War, but they were kept in storage due to the lack of trained personnel. In 1947 the first Greek officers returned from training courses in the United Kingdom and training of tank crews began. The Centaur saw limited service in the civil war, as during the last year of the war (1949) battles were fought on mountains. Centaurs formed the core of the Greek Armour Corps during the 1950s, and were retired in 1962 having been replaced by US built M47s. Attempts to mount the 75 mm Vickers HV gun on the Cromwell were unsuccessful because the turret was too small. Allied star identification marking is missing. The Royal Armoured Corps recognition mark (or flash) was only used until mid-1942. This page has been accessed 404,307 times.